The name lomatium generally refers to Lomatium dissectum, one of the numerous species and varieties of the Lomatium genus that is native to western North America. Lomatium is a member of the Apiaceae (carrot) family and grows in the northwestern United States and south-western Canada. Like many wild plants that have attracted the attention of commercial interests, lomatium is presently threatened with extinction over parts of its range. In the wild, lomatium grows in rocky soil and reaches a height of 3 ft (0.9 m). The entire lomatium plant is edible, and numerous Native American groups regarded the lomatium plant as a food source and medicinal remedy. For cultivation as an herbal remedy, lomatium roots are unearthed during the months between early spring and fall. Roots are washed and dried for several days. The roots are then sliced and allowed to dry again. When dried correctly, lomatium is said to keep its medicinal properties for 2–3 years. Lomatium’s antimicrobial activity is due to the tetronic acids and glucoside of luteolin that it contains. Other ingredients include the resin, which causes rash in some people, and coumarins, which could possibly cause rash as well. The coumarins, however, are being investigated for their possible usefulness in treating HIV infection. Lomatium is also known as Indian biscuit root, biscuit root, desert parsley, desert parsnip, fern-leafed lomatium, ferula dissoluta, Indian desert parsnip, Indian parsnip, leptaotaenia dissecta, tohza, toza, and wild carrot. Many Native American groups recognized the value of lomatium as a source of nourishment and medicinal remedy. Lomatium root was peeled, dried, and ground into flour to make sweet-tasting biscuits. Lomatium seeds were eaten raw or roasted, or ground into flour for baking. Native Americans chewed on the root to treat a range of respiratory infections. Lomatium was used for conditions including cold, flu, bronchitis, tuberculosis, hay fever, asthma, and pneumonia. Lomatium was also used in a tobacco mixture. The herb was smoked during rituals, and healers used the smoke to treat respiratory infections. Lomatium was used when the Native Americans were exposed to tuberculosis and other diseases that Europeans brought to North America. When the world faced the influenza pandemic of 1917–18, Americans tried remedies such as castor oil, tobacco, aspirin, and morphine. 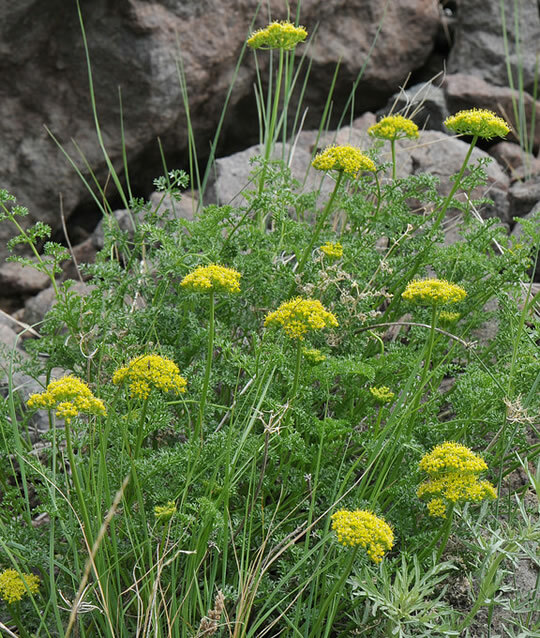 American herbalists recommended use of lomatium, and the remedy was used with reported success, especially in the Southwest. Lomatium is currently used as an antiviral remedy to treat colds, coughs, and infections. The herb is also known for boosting the immune system and reducing inflammation. Lomatium can relieve chest pain and stomach upset that frequently accompany the flu. It has also been used for conditions such as asthma, hay fever, mononucleosis, infective bronchitis, tuberculosis, and the early stages of tonsillitis. Other uses of lomatium include treatment of skin infections, cuts, and sores. A health practitioner might recommend the use of lomatium for a person diagnosed with fibromyalgia, a muscular inflammatory condition. Causes of fibromyalgia are not known, but are thought by some to be connected to viruses. Symptoms include an impaired immune system, chronic pain, and fatigue. Lomatium was among the plants placed on Mon- tana’s plant protection list in April 1999. The state enacted a law that placed a three-year moratorium on the wildcrafting of lomatium, wild echinacea, butterroot, and sundew that grow on state land. Wildcrafting is the harvesting of herbal plants in the wild. Plants like lomatium face the risk of becoming endangered because of increased popularity and usage of herbal remedies, and reduction of habitat due to development. A moratorium on wildcrafting is one way to protect plants in the short term. Long-term solutions include habitat protection and cultivation of herbs in home gardens and on commercial farms. Lomatium is available as an extract, as a tincture, and in capsule form. Fresh root extract in an alcohol solution is believed to be the most effective remedy. Lomatium tea, an infusion, is made by pouring one cup of boiling water over 1–2 tsp. of the dried herb. The mixture is steeped for 25 minutes and then strained. Lomatium tea can be taken three times a day. Lomatium contains a resin that can cause a painful rash in some people. To avoid this rash, people can use “lomatium isolates,” which are extracts with the resins removed. The extract can be taken at a dosage of 1–3 ml each day. In tincture form, the daily dosage is generally 10–30 drops taken one to four times per day. Children who are ill with colds or flu can be given lomatium capsules. Before beginning herbal treatment, people should consult a physician or health practitioner. A knowledgeable herbalist can give advice about dosages. Consultation is important because high doses of lomatium can cause nausea and an itchy rash that covers the entire body. Lower doses can also cause rash in people who are sensitive to lomatium resin. A person should first take a small amount of tincture to test for a rash reaction. 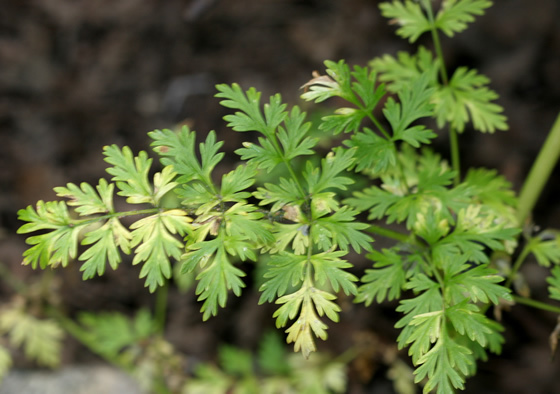 The rash will go away in one to six days after discontinuing use of lomatium. Lomatium and other herbal remedies are not regulated by the United States Food and Drug Administration (FDA) in the same way that prescription drugs are regulated. This difference means that the effectiveness of lomatium has not been scientifically tested. In addition, supplements are not standard in their ingredients or dosages. Women who are pregnant or nursing should not use lomatium, because its safety for these conditions has not been determined. Although lomatium is generally believed to be safe, the herb has been reported to cause a skin rash. A high dosage of the herb may result in nausea. Lomatium has been reported to potentiate (intensify the effects of) two groups of drugs, anticoagulants (blood thinners) and immunostimulants (drugs given to boost the immune system).